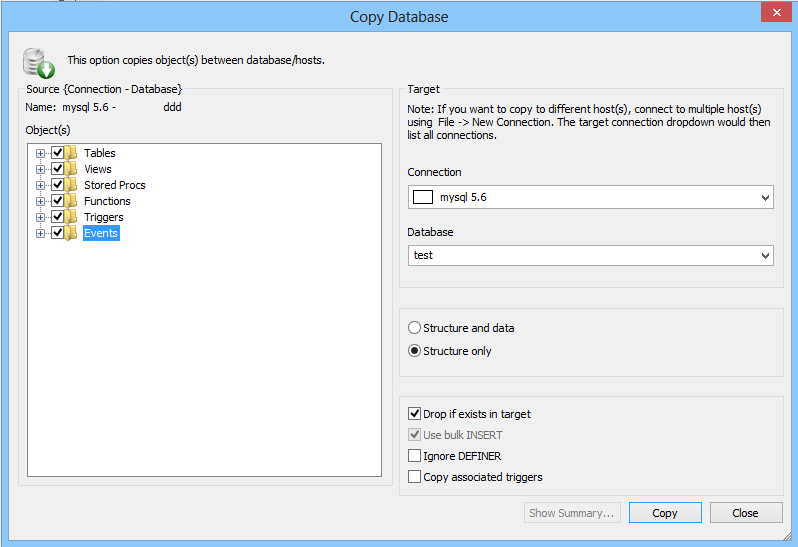 Select the Database you want to copy and then Select Database -> Copy Database to different Host/DB to copy a database (with all or selected items of its table structure as well as the data) to another database (which may be located in another host). In Copy Database dialog box, first select the object(s) like tables, views, stored procedures, functions, triggers and events to be copied from the source database. You may Select All/Deselect All by clicking on tree node check boxes to select the object(s) quickly. Now you can create a database in the target by simply typing the Database name or you can select the target database from the drop down where you want to copy the data. Click Drop If Exists In Target to first delete the named object(s) in the destination database before copying them from the source database. Click Ignore DEFINNER to Ignore the DEFINER clause for database objects. Note that the target server will then create DEFINER as current SQLyog user when creating the object. Click Structure Only to copy the selected object(s) with no rows (the destination table is empty) or click Structure And Data to copy the object(s) along with its data in the destination database. Click Copy associated triggers to copy associated triggers of selected tables from objects tab. If Copy associated triggers is checked associated triggers can be added or removed by just selecting or unchecking the tables. At the moment you click the 'Copy' button it changes to a 'Stop' button. You can stop the copy process if you by accident should have started a copy process taking more time that you foresaw. What has been copied must then be deleted manually, if you do not want to keep it. Note: To specify a database on another host as the target database, you must first connect to that host using File -> New Connection (or the corresponding icon).